A new report argues that U.S. bank CEOs are paid too handsomely for otherwise lackluster performances. Analysts from UK-based Aktis, a data platform that tracks bank governance, looked at compensation for bank CEOs at the largest European and American banks and concluded that European banks “seem to have aligned pay and performance more effectively” than their American counterparts. Aktis looked at 22 global systemically important banks (or G-SIBs) and measured CEO pay against their respective banks’ return on average assets — a commonly used ratio to assess the profitability of a bank’s balance sheet. Aktis also measured pay against net interest margin (NIM), the difference between interest earned on loans against interest paid on deposits. Aktis data from 2009 to 2017 shows U.S. bank CEOs salaries growing more than return on average assets and net interest margins. 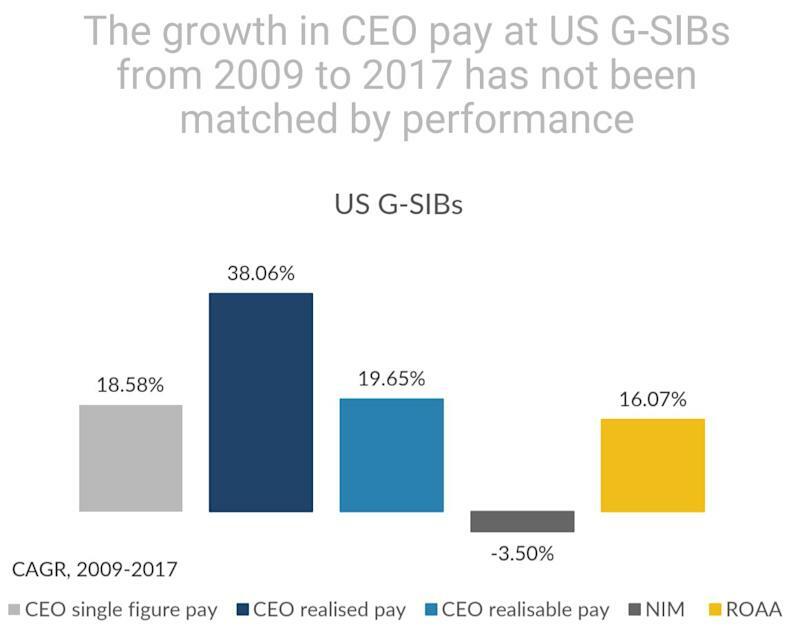 When controlling pay for bonuses and incentives that are actually paid out during the year (realized pay), the report notes that the largest U.S. banks grew their CEOs’ salaries by 19.65% between 2009 and 2017 — the post-crisis recovery period. During that same time, return on average assets only grew by 16.07% as NIM decreased by 3.50%. “In addition to performance and pay, no evident correlation can be found between CEO tenure and pay,” the report read. European bank CEO salaries contracted during the 2009-2017 period, as return on average assets also fell. 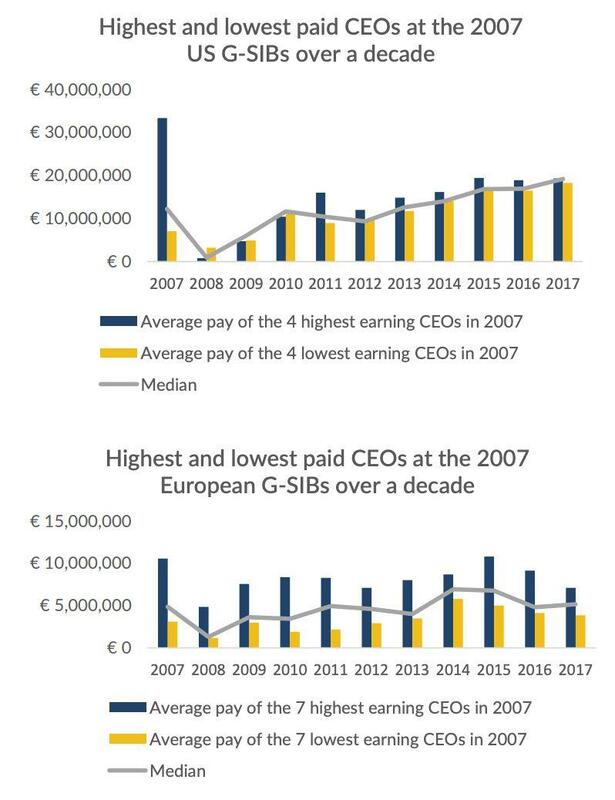 At the European banks, realized CEO pay actually decreased by 8.63% between 2009 and 2017, as return on average assets fell by 2.27%. But the largest European banks actually improved NIM 3.50%. The bank performances partially lend themselves to differing economic conditions in the U.S. and in Europe. While the U.S. economy has bounced back considerably, the European economy has struggled to gain momentum as debt crises and political risks continue to unfold. Italy has already tipped into recession and Germany is toeing the line. The regulatory landscape could also contribute to the poor NIM performance among U.S. banks as well. Research from the Federal Reserve has shown that low-interest rate environments make it harder for banks to widen their margins on loans compared to deposits. But the Fed’s research notes that capital requirements — long seen as more stringent in the U.S. compared to Europe — constrain banks from being able to improve their margins. Still, U.S. bank CEOs are paid fairly well. JPMorgan Chase (JPM) CEO Jamie Dimon, for example, netted $29.5 million in 2017. Among the eight largest U.S. banks, Dimon is the only sitting CEO to have led his respective company through the financial crisis. But even newer CEOs, like BNY Mellon’s Charles Scharf, made as much as $17.1 million in 2017. Tim Sloan, who has been CEO of Wells Fargo (WFC) since 2016, made $17.6 million in 2017. Aktis says the median average among all 22 banks studied was around 8 million euros, or just over 9 million U.S. dollars. The median pay among the largest European banks has been steadier and lower than median pay among the largest U.S. banks. 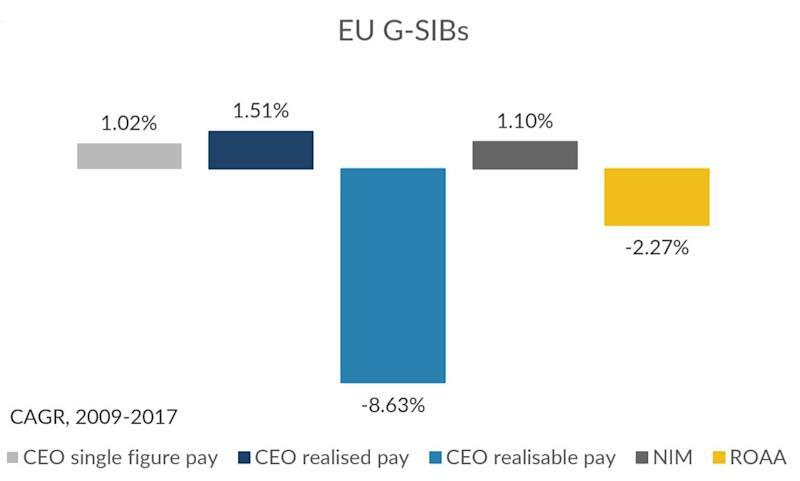 The report notes that European bank CEOs make considerably less partially because of the absence of bonuses. Jean-Pierre Mustier, CEO of Italian bank Unicredit, refused bonus pay in 2016 due to his bank’s performance. The same year, then-Deutsche Bank CEO John Cryan also chose to waive his bonuses due to his company’s poor showing. There are also regulatory reasons for lower pay in Europe; EU regulations implemented after the financial crisis impose limits on how variable pay bonuses can be structured. Aura Toader, corporate governance analyst at Aktis, told Yahoo Finance that the U.S. tends to offer more attractive signing packages than EU companies do. The discrepancy between U.S. bank CEO salaries and regular employees is stark; the report noted that the eight largest U.S. bank CEOs are paid 277 times more than the median employee pay on average.